A friend recommended On Writing by Stephen King after I shared my challenge with plotting out the rest of my first book. Though I never read any of his books, I know he must be pretty good to keep his readers asking for more. He shared two things that surprised me the most. Since English is not my first language, I’ve always thought being a slow reader is one of the main reason why I may not ever be a good writer. I guess he just kicked the crutch I’ve been using to drag myself down. Almost all the writing books tell me to “study” other books for the plot structures or the writing techniques. Something I could never do. If the book is good, I just want to read it, If the book is uninteresting, I’d stop to save myself time for work or another book. It’s good to know Stephen King, a great writer, reads for fun, too. Some reviewers of this book did not like that Stephen spent good part of the book on his life journey to be the writer he is today, instead of going straight into the how-to-write part. I thought it is good to remind people to look further back than his successful career. 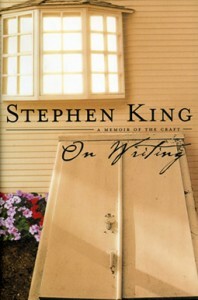 This entry was posted in I Learned This, I Read This, Musing and tagged learn from other writers, On writing, Stephen King by n2n. Bookmark the permalink.